Damn! Doesn't she look hideous? Consistency is the hobgoblin of small minds. This isn't my dress! I'm going to sue for $54M! Marilyn Manson had a press conference today to announce his summer tour plans. "My sister!! My Husband!! My Cat!!! My bed!!!!!!" Monica Lewinksy's mother did not react well to finding a stain on the dress her daughter borrowed. (Singing): "I see a little silhouette of a man SCARAMOUCHE, SCARAMOUCHE can you do the fandango . . . "
The family dog keep leaving "surprises" around the house. It's the best I can come up with. The new lead singer for Cannibal Corpse. I TOLD YOU MY X CAME BACK AS A DRESS!!!!!!!!!!!!!!!!!!!!! 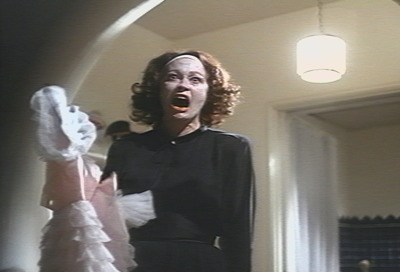 Joan Crawford: screaming zombie berserker and designer of children's formal wear. "Next On The Real World, "Ragan (Exorcist)", Will Apologize For The Green Pea Soup On Amanda's Great Grandma's Wedding Dress." "She Was Trying To Hit Puck, But Missed. Puck Then Flicked Boogers At Her To Exorcise The Demon Out Of Her With His Blessed Boogers."